The Coffey County Schools are excited to announce a great series of presentations that will be held next Monday and Tuesday in the Burlington High School Theater. 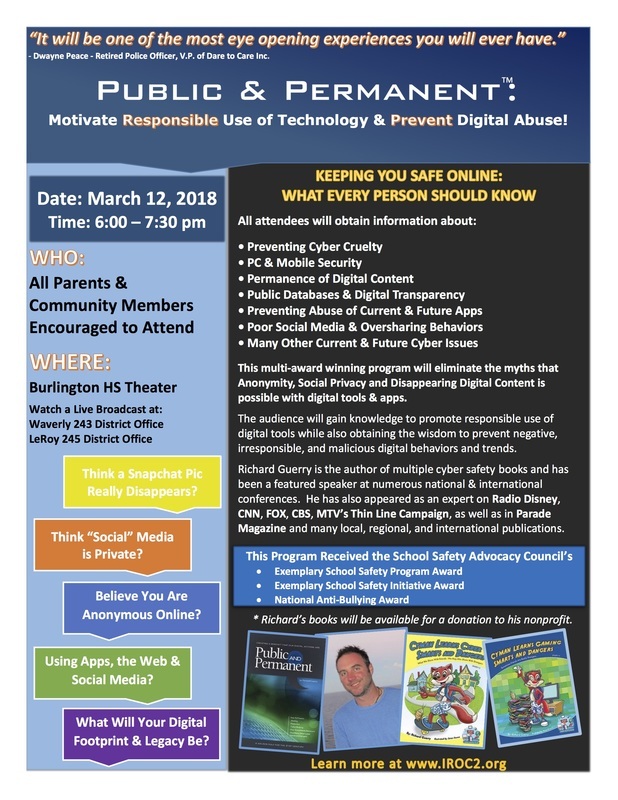 The Title of the Presentation is: Public and Permanent: Motivate Responsible Use of Technology and Preventing Digital Abuse. Students in all the county schools will be included in these presentations on Monday and Tuesday, March 12th and 13th. A Parent/Community presentation will be held on Monday, March 12th from 6 pm to 7:30 pm. You can attend live at the BHS Theater, or you can also attend a LiveStream of this event at the Waverly Board Office and the LeRoy Board Office. The Boards of Education of all 3 districts will meet at 7:30 pm after the presentations are complete. This could be the single most important presentation you attend to help protect you and your family. "This goes well beyond just computer and Internet safety that we have done presentations on in the past," noted USD #244's Director of Educational Technology, Doug Vander Linden. "These sessions will focus on digital security and safety that extends to a person's cellphone and their social media pressence as well. We believe that this information is so important to share with not just students and teachers but with the parents and community as well." This multi-award winning program will motivate the audience to utilize technology as a tool to thrive online and open windows of opportunity.